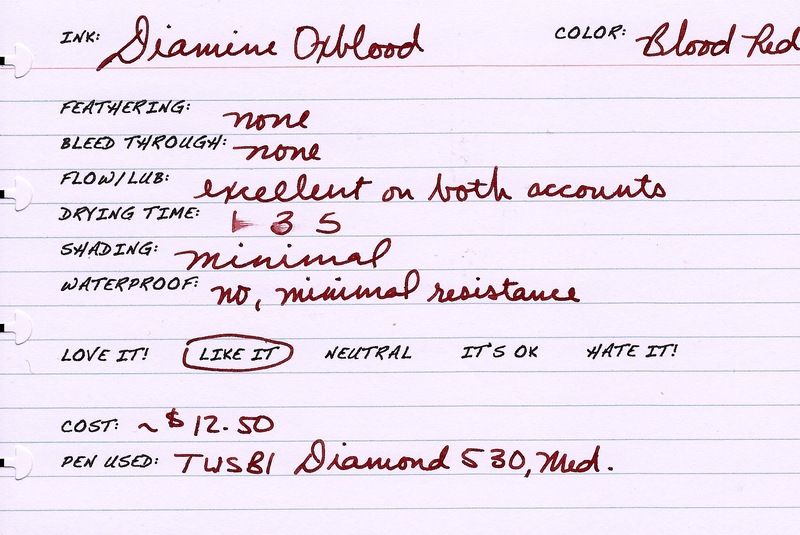 Earlier this week I reviewed Diamine Red Dragon. Today’s ink, Diamine Oxblood, is cut from the same clothe so to speak. As a matter of fact, if someone told me that Red Dragon was stumbled upon while trying to manufacture Oxblood I’d believe it. The differences, however, are obvious. Oxblood is much darker, and has a bit more brown in it. It definitely has the look of blood. The ink itself is exceptionally well-behaved. Further, although I’m not one to use red ink for everyday tasks, this ink would be perfect in that role. It is a very subdued color, and it’s very easy on the eyes. I like it! Not waterproof, and only minimally water-resistant. I find myself using this as an everyday ink. I sometimes think I should’ve got the Syrah, but this works well and is interestingly dramatic.